The prison movie has long been one of the most popular of the crime genre. Beginning with 1930’s THE BIG HOUSE, to THE SHAWSHANK REDEMPTION and beyond, audiences flock to get a forbidden glimpse behind the walls. 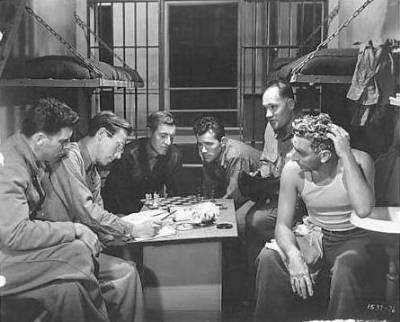 Newspaper columnist turned film producer Mark Hellinger gave us one of the starkest, most realistic looks at prison life in BRUTE FORCE, as relevant now as it was back in 1947. Westgate Penitentiary is a walled island facility much like Alcatraz, ruled with an iron hand by Captain Munsey (Hume Cronyn). 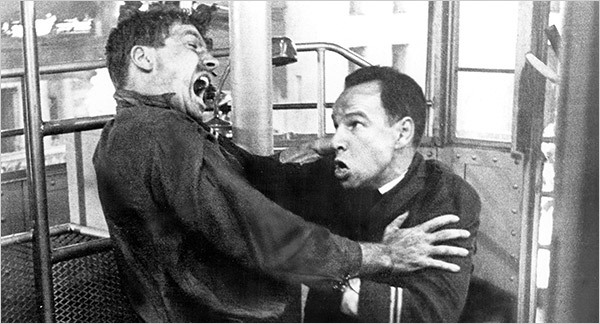 The warden (Roman Bohenen) is weak and inefficient, and the prison doctor (Art Baker) a drunk. 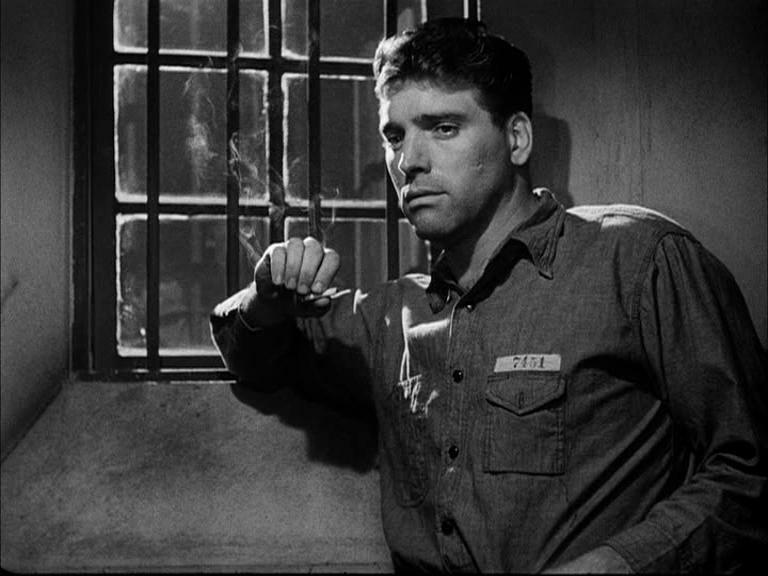 Inmate Joe Collins (Burt Lancaster), just back from solitary thanks to having a shiv planted on him by one of Munsey’s stoolies, is desperate enough to plan a jailbreak with his cellies in R17. They stage a fight in the machine shop and drive the rat to his death while Joe visits with the doctor, making sure he has an airtight alibi. The politicians are in an uproar about the prison’s lack of discipline, and threaten the warden that changes will be made if things aren’t straightened out. Joe makes a proposition to Gallagher (Charles Bickford), a veteran con, to break out. Gallagher declines, stating he’s up for parole soon, and has it pretty easy playing both sides of the fence. Flashbacks are used throughout the movie to humanize the cons in R17, as we see them on the outside with their women. Joe’s girl Ruth (Ann Blyth) is a cripple with cancer. His lawyer tells him she refuses to have a life-saving operation until he returns. Joe doen’t want her to know where he is, as he’s shielded her from his criminal life. Joe gets a message to visit a con in the infirmary, who tells him the drainpipe is the answer to his way out. A cryptic reference to “Hill 633” provides Joe with the means to carry things out. Munsey causes one of the cellmates (Whit Bissell) to hang himself, and the warden, under more pressure, revokes all convict privileges. All scheduled paroles are cancelled, and Gallagher now agrees to go along with Joe’s escape plan. Munsey sends the men to work in the drainpipe, but what they don’t know is there’s a rat among them, and Munsey’s on to their scheme. Just before setting things into play, the warden is forced to resign, and Munsey is put in charge. The cons riot while the breakout is on, culminating in a death struggle between Joe and Munsey in a gory ending inside a flaming guard tower. 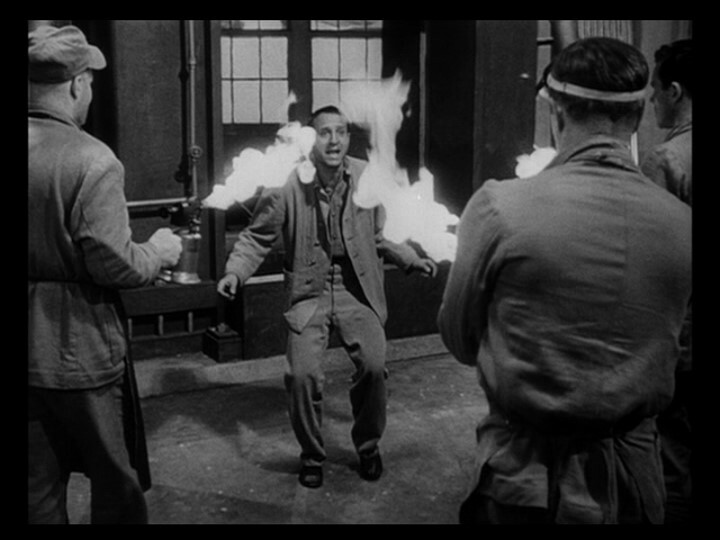 Burt Lancaster’s Joe Collins is the ultimate anti-hero, clearly a criminal, but we sympathize with him. His love for Ruth shows us his softer side, and though he’s on the wrong side of the law, we cheer him on, rather than the corrupt Captain Munsey. Cronyn’s Munsey is vain, sadistic, and tyrannical. His methods of intimidation and brutality make him as bad (if not worse) than even the hardest con. It’s a subtle, well drawn portrait, and I think it’s Cronyn’s best screen performance, which is saying a lot considering his long body of work. The rest of the cast is a testosterone fueled bunch, including Howard Duff (billed as “Radio’s Sam Spade in his first screen role”), Jeff Corey, Sam Levene, Jack Overman, John Hoyt, Jay C. Flippen, and Gene Roth. The ladies are represented by Blyth, Yvonne DeCarlo, Ella Raines, and Anita Colby. Black actor Sir Lancelot plays Calypso, who serves as a sort of Greek chorus for the film, much like he did in Val Lewton’s 1943 I WALKED WITH A ZOMBIE. The screenplay by Richard Brooks is tough as nails. Brooks wrote another Hellinger movie, THE KILLERS, and worked on John Huston’s KEY LARGO, before becoming an acclaimed writer/director of his own with THE BLACKBOARD JUNGLE, ELMER GANTRY, IN COLD BLOOD, and LOOKING FOR MR. GOODBAR. 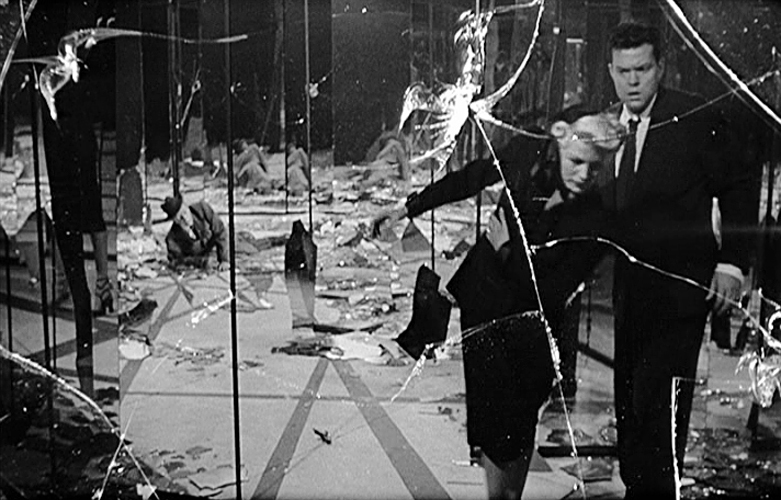 Director Jules Dassin came up through the ranks of b-movies before scoring with THE CANTERVILLE GHOST. He collaborated with Hellinger again on THE NAKED CITY , and made NIGHT AND THE CITY before falling victim to the Hollywood blacklist. Moving to Europe, Dassin continued his fine work in films like RIFIFI, TOPKAPI, and NEVER ON SUNDAY with his wife, Greek actress/activist Melina Mercouri. 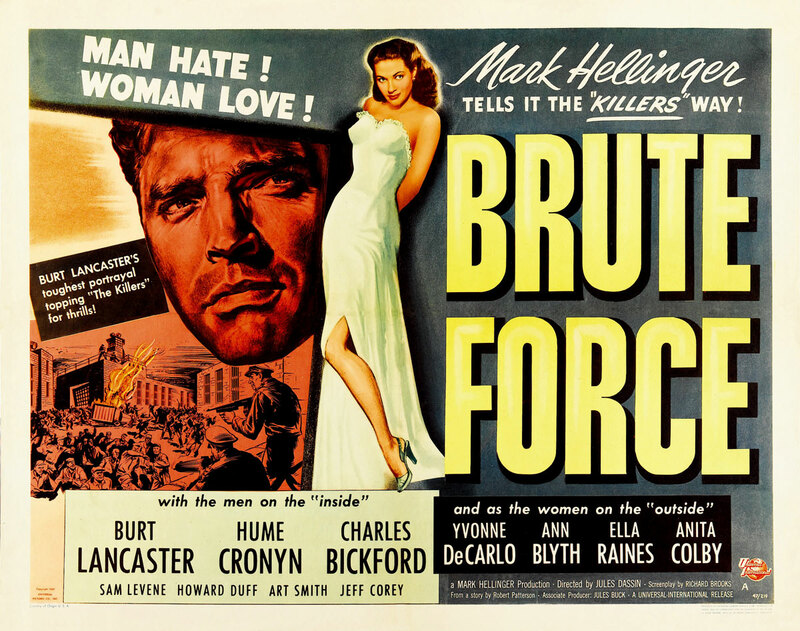 BRUTE FORCE is a violent, gritty movie that was way ahead of its time. It’s a no holds barred look at a hard life, and retains its punch even today. Well worth watching for its realism, and particularly for Hume Cronyn’s chilling performance as Captain Munsey. A true classic! The new actors and new movies of today, just can NOT compare with yesteryear’s!! I always love Cracked Rearviewer to get my classic film fix! !